The most important markers of a successful career are challenging, skill-enhancing assignments, recognition as a talented, highly motivated individual, and ever-increasing responsibility and visibility. A career with these characteristics depends in large part on the people controlling your workflow, exposure, and training having very positive impressions of you. Hard work and first-rate work product are essential, but make no mistake: unless your supervisors, colleagues, and customers/clients have an impression of you as a person of real competence, justified confidence, and high potential, there will be little you can do to advance your career. Other people’s impressions of you are based in part on reality, but equally or more so on their unconscious assumptions and expectations about you because of your appearance, bearing, education, race, gender, and age. In other words, people’s impressions of you, at least until they get to know you very well, are likely to be based in large part on stereotypes. For example, in a typical mixed-gender business meeting, the participants – both women and men – are likely to be operating with three stereotypes: men are agentic, that is, forceful, competent, independent, and assertive; women are communal, that is, deferential, friendly, warm, and supportive; and leaders are agentic. If the meeting participants are not well known to one another, these stereotypes will result in the participants forming immediate, reflexive, biased impressions of one another. As a result, if one of the women tries to take on a leadership role while conforming to the communal stereotype, she is likely to be seen as unsuited for the role and, therefore, ignored. On the other hand, if a woman attempts to lead by behaving contrary to stereotype and acts agenticly, she is likely to be viewed as unfeminine, unpleasant, and abrasive. This double bind – what we call the Goldilocks Dilemma – often results in women feeling that they are damned if they behave agenticly and doomed if they behave communally. The most effective way for a woman to escape this dilemma is to present herself in such a way that she avoids or overcomes these stereotypes and shapes other’s impressions of her so that they conform to those she wants them to have. How to escape the Goldilocks Dilemma? A woman’s ability to escape the Goldilocks Dilemma in this way—to effectively manage her impressions—depends on her having (or developing) a high level of emotional intelligence: (1) an awareness of what she is communicating through the totality of her verbal and nonverbal behavior; (2) a recognition of whether the people with whom she is dealing are forming the impressions of her that she wants them to have; and (3) a capacity to change how she is communicating if she is not making the desired impressions. An example from another context may be helpful in illustrating the use of impression management. A few years ago, Andie was retained to handle a major tax audit. The lead IRS lawyer was a man’s man, an avid sports fan, and dedicated hunter. Andie knew little about sports and nothing about hunting. She could find absolutely nothing to talk to this man about except the weather and taxes. Her job, however, was to settle the case on terms acceptable to her client, and she knew that to do that someone had to be able to speak the IRS lawyer’s language, share his interests and outlook, and establish sufficient rapport with him to engender trust. Andie knew she could not do that, so, she brought onto the team a talented male tax partner who was also a man’s man – a man who hunted, fished, and had season tickets to the Bears. And you know what? After a couple of weeks, the IRS lawyer and her male partner bonded and the client eventually got the settlement it wanted. Why Women Resist Impression Management? 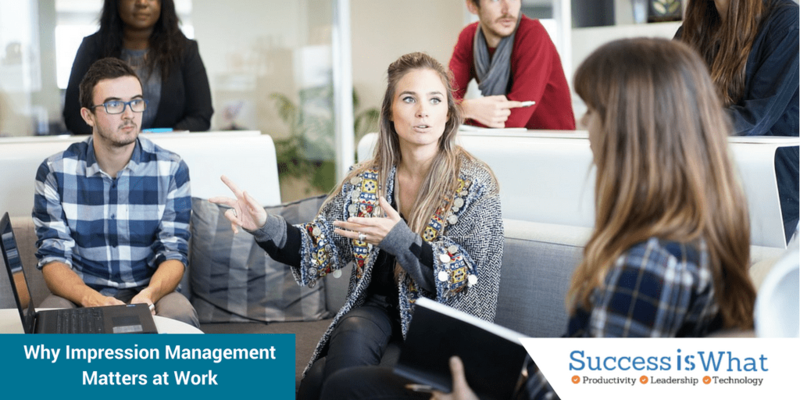 What Andie did might be called “team impression management,” making sure the impressions your team is making are those that are needed to get its job done. Very often, however, you are the whole team. This is particularly true when the job to be done is advancing your own career. In this situation, if a more decisive, agentic style is called for, you need to provide it; and if a more inclusive, communal style is needed, that’s up to you, too. You wouldn’t hesitate to bring another person onto a team if that person’s qualities were needed to get the team’s job done. Likewise, you shouldn’t hesitate to adopt a different communication style if that is what it will take to get your job done. Managing the impressions others have of you is not being inauthentic. Quite the contrary. The only way you can assure that the impressions others have of you are the impressions you want them to have is by being deeply connected with your own capacities, feelings, and concerns. You need to be able to draw on all of your personal qualities to put the spotlight directly on those aspects of your personality that are most appropriate to achieve your objective in each unique situation. Promotion decisions are very often made on the basis of highly subjective judgments about fit, competence, and potential. If you are going to move up in your organization, you need to be sure you are recognized by your supervisors and colleagues as someone ready and able to perform at the next level. This means you need high visibility and a talent for self-promotion. In other words, you need to carefully manage your impressions. Andrea S. Kramer and Alton B. Harris are the authors of Breaking Through Bias: Communication Techniques For Women To Succeed At Work, (Bibliomotion, Brookline, Mass. 2016). Join the conversation at www.AndieandAl.com.